Yes it is! It's that time of the year that we show our wonderful teachers just how much we appreciate all that they do. Of course a bag of Joseph's Grainery Multigrain Pancake Mix or Whole Grain Cookie Mix would be a hit with any teacher, but we know some of you are like MaMa and have fun being a little creative, so we thought we'd share what we did for my preschool teachers today. To put these fun gifts together, MaMa and I mixed up some of our favorite Wheat Berry Granola. This stuff is awesome on some Greek Yogurt and even better with some fresh fruit added to make a parfait! We thought some wheat berry granola would make a fun morning treat for my teachers, so we put the granola in a canning jar. 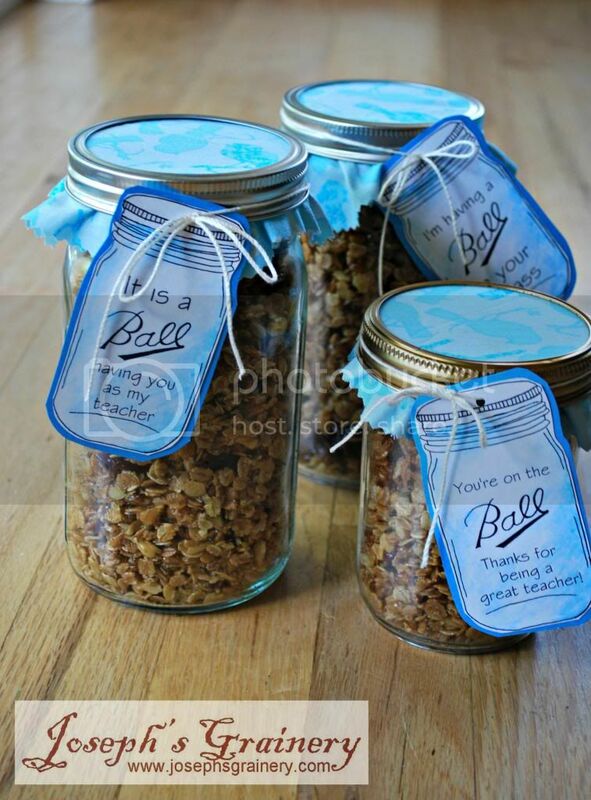 Cute gift tags add a creative touch to this teacher appreciation gift. Then to add the extra cute-ness factor, MaMa saw these adorable printable gift tags on Pinterest and clicked through to The Country Chic Cottage to print them off. Since we didn't have plain white card stock, we printed them off on regular ol' paper and then glued them to some blue card stock we had on hand. 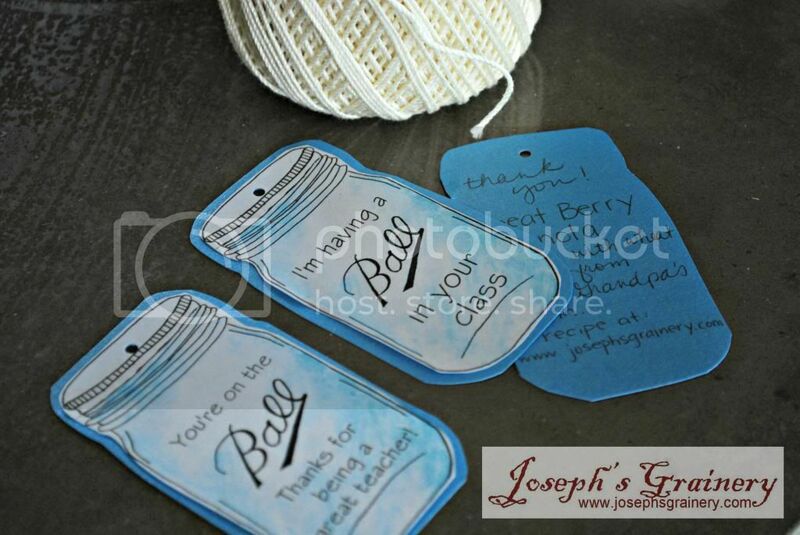 Punch a whole in the top, add some twine and a personalized message on the back and you've got yourself one fun gift idea for teacher appreciation week! Have you checked out our Pinterest page? 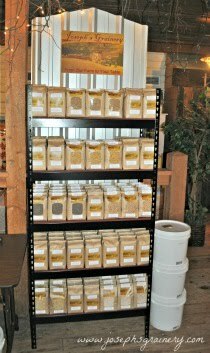 We have all sorts of other great whole grain gift ideas and free printables pinned, not to mention all sorts of recipes for whole grains and legumes that we hope to try. So hop on over and start following us on Pinterest too! 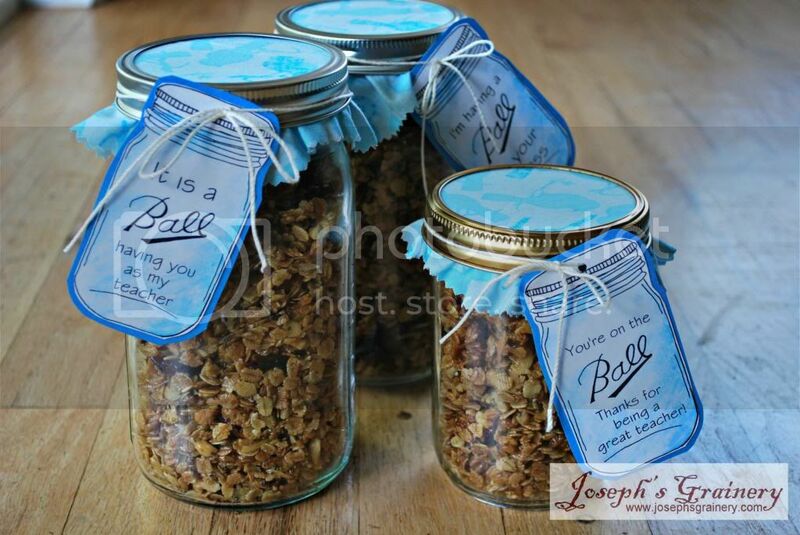 So whether you show your teachers some love by giving them some Joseph's Grainery Whole Grains or not, the important thing is to make sure you let your teachers know they are appreciated!